For most of my life this has been the ONLY option I wanted for birthday cake. I distinctly remember a castle cake with towers out of OJ concentrate cans covered in construction paper; and I remember one of those doll skirt cakes. But after about third grade this pound cake was, for me, the only suitable option for birthday cake. Most of my siblings have similar feelings, and here we are decades later (!!) and all I want for my birthday is pound cake. The outside crust is a little bit chewy, but not too chewy. The inside is soft and tender without being delicate. The top crust crinkles under your teeth in the most satisfying manner. Basically, this cake is perfection. With birthday candles. And because today I turn 31 (cue: noisemakers with confetti, balloons, party hats) it is only appropriate that I share some cake with you. There is a lot of mixing in this recipe (thank you, trusty KitchenAid for taking on the heavy lifting), and more timing requirements than anything else I’ve ever made. But I’ve found I don’t mind hanging out in the kitchen for 15 or twenty minutes if the prize is an entire pound cake all to myself that I can share with my friends. So, set the timer and find something to do in the kitchen for a little while so you can babysit the mixer while it creates this delicious cake! At least an hour prior to mixing the cake remove the butter, cream cheese, and eggs from the fridge to come to room temperature (if your house is cold, let them sit on the counter for longer than that). When they are soft, cream the butter, cream cheese, and sugar for 10 minutes in a stand mixer on medium speed. Every 2 or 3 minutes stop the mixing and scrape the bowl with a spatula to make sure the butter and sugar on the bottom is getting whipped into frothy goodness with everything else. While this is mixing sift your flour into a bowl, and then carefully grease a bundt pan. Add eggs one at a time, beating one full minute after each. Again, use a spatula to scrape the bottom of your bowl to make sure the butter and sugar are thoroughly mixing with the eggs. Add vanilla with the last egg. Sift flour with the salt (this makes the flour sifted TWICE, then measured). Add flour to batter 1 cup at a time with mixer on low speed, folding in for about 30 seconds. Scrape the bottom of the mixing bowl to make sure you are incorporating the butter and flour together. 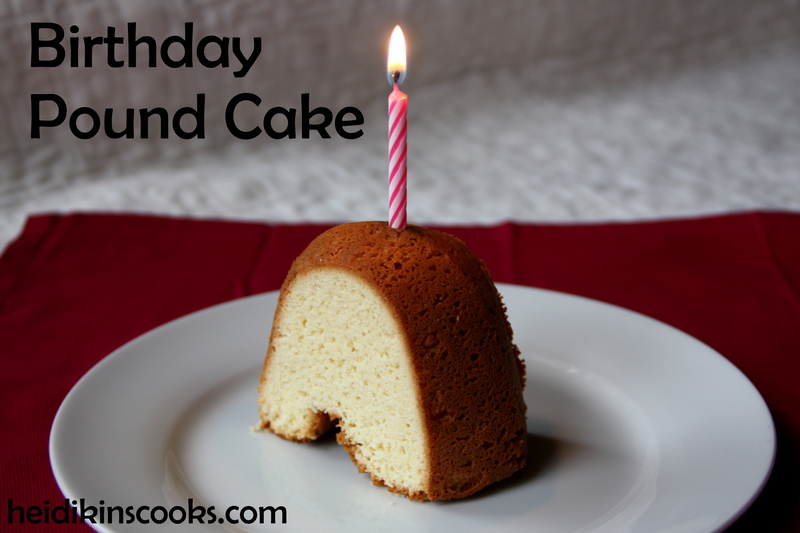 Pour batter into a greased and floured bundt pan and bake for 1 hour and 15 minutes. Cool on wire rack for 20 minutes. Loosen edges with a small spatula or thin butter knife, turn out of pan onto rack or serving platter and let cool completely (several hours). The easiest way to do this is to rest the rack/platter on the cake while it’s in the pan and then turn the whole thing upside down, trying to flip the bundt pan without the platter in place results in an achey-breaky heart cake. Pound cake really doesn’t need frosting, a little raspberry sherbert or strawberry ice cream on the side is perfect. Left… comment… on wrong… recipe!